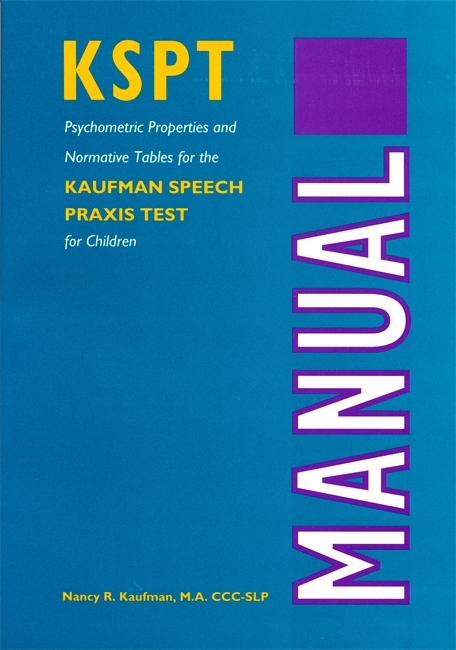 Based on years of experience and research, The Kaufman Speech Praxis Test for Children (KSPT) is an innovative new resource that assists in the diagnosis and treatment of developmental apraxia (dyspraxia) of speech in preschool children. Developed by Nancy Kaufman, a national authority on verbal dyspraxia, the KSPT identifies the level of breakdown in a child's ability to speak so that treatment can be established and improvement tracked. Easy to administer and score, the test measures a child's imitative responses to the clinician, locates where the child's speech system is breaking down, and points to a systematic course of treatment. Results of the KSPT are useful beyond establishing an initial diagnosis. Gains in motor-speech proficiency can be measured and quantified in several ways. Individual sections of the test can be used to establish treatment goals and measure progress. The KSPT Kit comes with one packet of 25 test booklets. Additional test booklets can be ordered. Test booklets come 25 to a package.